The ItemRegistry is responsible for keeping track of all run-time items. Keep in mind that if you're going to create a new item instance you'll have to register it with the item registry. Networked registry's (for example: for UNet) are prefixed with Server. The Server registries should only contain server collections. Item instances are run-time objects that can be created through code. These items are always based on an item definition, which is a persistent data structure that contains all basic information about the item. Because item definitions are persistent their information should not change at run-time. Item instances need to have a constructor that takes a IItemDefinition (or derived type) and System.Guid argument. // An example of a constructor for an item instance type. // Note that you can make the constructor protected or private to avoid users from directly instantiating the item without going through the ItemFactory. When creating a new item instance you'll have to assign an unique GUID. These GUID's are used for registry indexing, network transmission / ownership and serialization. You can create a new System.Guid instance through System.Guid.NewGuid();. Item instances should contain run-time info; Item definition should contain static information. In the example below we add stats to the item instance. Because this data is in the item instance the data can manually be set per item instance. // Add stats to the run-time item. Using the item instance is simple; Simply pass in the character using the item and the ItemContext. // Completely optional you can define if you want to use more than 1. Item Definitions only transfer their GUID over the network, therefore, make sure to persistently store all item defintions if you're using multiplayer. Sometimes you may want to create a variation of an existing item. This can be done through nesting item definitions. For example: You have a "Sword" and would now like to create a "Fire Sword". This can be done through nesting item definitions. The parent and child item definitions can not differ in type. 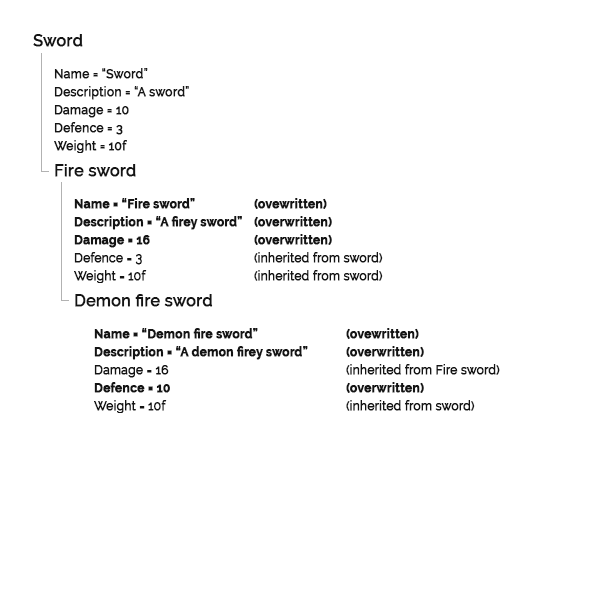 In the example below the fireSword inherits all of "Swords" properties, however, can still handle it's own values. When settings the fireSword.property back to the default(T) it will grab the value from it's parent (sword). For example: fireSword.damage = 0; (where default(int) == 0). The firesword will now ignore the fireSword.damage property and use its parent property sword.damage instead. // Create a fireSword that inherits from sword. Resetting values to use the parent value. When creating a custom item definition you have to make a small adjustment to make it compatible with nesting. This is very simple and is handled by extension methods. Always use the this.GetValue(o => o._property); selector to select your items to enable nesting. In the example below 2 items that have the same item definition are considered equal, and can therefore be stacked in collections. When calling a method like GetAmount(myItem); this will return the total amount of items equatable to "myItem".